"I, Robot" is the theme for this year's edition of Burning Man, the world famous, week-long participatory festival held in Nevada's Black Rock Desert. 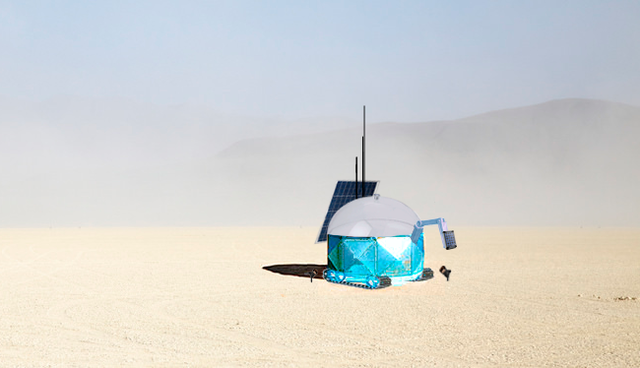 Kicking off this Sunday, the temporary city will feature worthy heirs to the storied history of Burning Man art installations, with grandiose, kooky, thought-provoking, and interactive work. So if you want to send your voice into space, see a machine that makes its own clouds, or simply enjoy a coffee and sandwiches in a 1940s diner complete with servers in period-appropriate dress, I have some good news for you! A rendering of Cirrus, a robot explorer. "Cirrus" is a solar-powered robot that pulls weather data from any zip code and translates that data into musical arrangements — which it then plays. According to L.A.-based creator Matthew Pagoaga (Burner name: Mr. Pimm) nicer weather leads to nicer compositions. "As global warming occurs, it will sound worse and worse," he said. A rendering of the interactive CROWN installation. Tall, bright, and beautifully hypnotic in its conception, "CROWN" represents many of the elements which have come to be associated with Burning Man art installations. Using a hydraulic mechanism, the colorful, 30-foot towers can move back and forth, up to 40 degrees, and will be lit by thousands of LED lights. 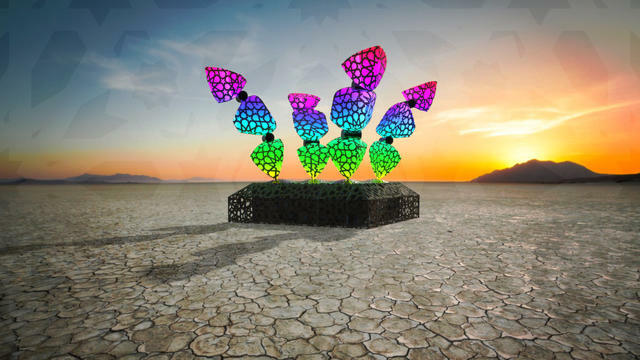 True to Burning Man’s core theme of participation, the installation will be interactive, allowing for passersby to control the towers and their colors. "Dust City Diner" is a portal to the 1940s. 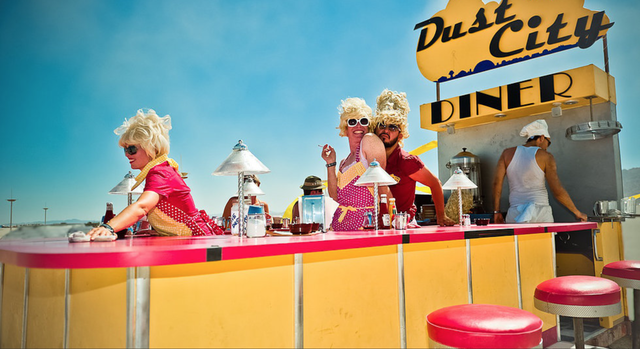 Originally created in 2008, "Dust City Diner" is a 1940s-style diner plopped down in the middle of the desert. Created as performance art, coffee and grilled cheese are served by servers, and made by a short order cook, all in period costumes (and hairstyles). "Dust City Diner" is always open and moves around — so as to better spread the love. "Encrypted Data" is art as a riddle. 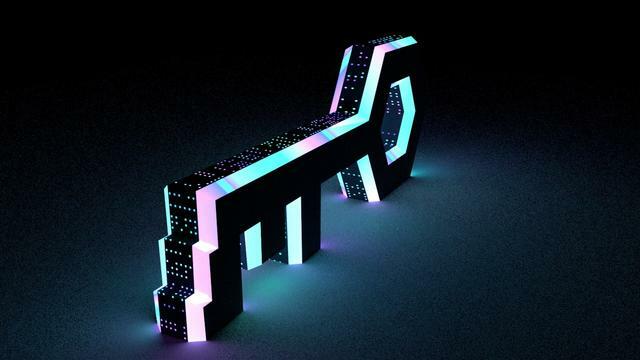 Akin to the obelisks in "2001: A Space Odyssey," "Encrypted Data" is far more than it seems at first, and what it seems like is a very large (20-foot long, 7-foot high) key-shaped structure. But upon a closer look, the installation allows visitors to print out their own coded messages, which can only be decrypted after Burning Man ends. Beyond this, the key itself embodies a kind of treasure hunt, offering riddles and surprises — not least of which is that it's a character itself. A rendering of "RadiaLumia," a geodesic sphere that evokes a desert protozoa. From the creators of "Blumen Lumen" and "Shrumen Lumen" — large interactive flowers and mushrooms respectively — comes the return of an ancient denizen to its home. 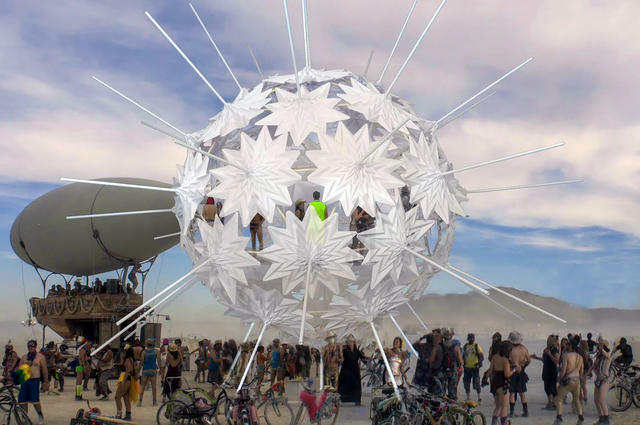 Inspired by the shape of a protozoa which used to live in the Black Rock Desert area back when it was was a sea bed, "RadiaLumia" is about 5 stories high and made out of 42 “breathing” origami shells that open and close. There will also be a platform inside, where visitors can climb up to get an inside view. A rendering of "In Case We Miss Each Other," which evokes a classic Roswell UFO. Like every installation at Burning Man, this giant, colorful, floating UFO isn’t there just for looks. Besides serving as a source of shade and shelter, visitors’ voices can get a ride into space on the UFO’s lasers, which have a 25-light-year range and which will be deployed by observatories. And, not to worry, the messages will also include information on how to decode them. The ship is 40 feet in diameter and will be constructed out of an aluminum frame with Lycra sails plus, of course, stunning lighting. 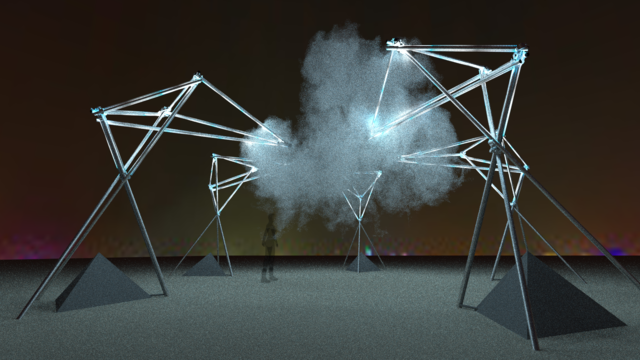 A rendering of "Ethereal Fleeting," which will creates clouds in the hot desert. This one makes its own weather. 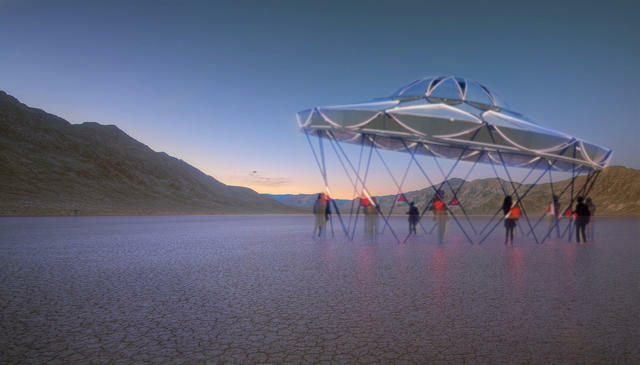 A team from Switzerland built a cloud-generation machine, which creates the clouds, confines them within the machine’s structure (where they will be lit up beautifully at night), and then releases them into the desert. Wind has a major say in how the clouds manifest themselves, so no two looks will ever be the same.